On our first date Chris Blair offered to cook dinner for me. As an architectural designer he felt the need to redo his kitchen, but consequently, given his addiction to cooking, he was suffering withdrawal. To ease his pain, he searched for places to cook. I happily obliged, since the way to my heart, mind, and soul and anything else was and is through my stomach. I beamed when he came prepared with all the fixings: beautiful lamb and spices for a Lamb curry and even a pan; however, I blanched when he pulled out “The Fanny Farmer’s Cookbook.” Fanny was great for simple, American fare, but Indian food? The joy of being wrong. He emerged from a clean kitchen – which I loved – and served one of the best curries I ever had eaten. Bok choi was another early date food where mercifully I kept silent when I watched him burn butter and then braise the quartered bok choi in the pan with a little chicken stock. At the meal, I grabbed a glass of water prepared to drown the burnt flavor, but instead closed my eyes and savored the caramelized vegetable, which resulted from his browning the butter, not burning it. 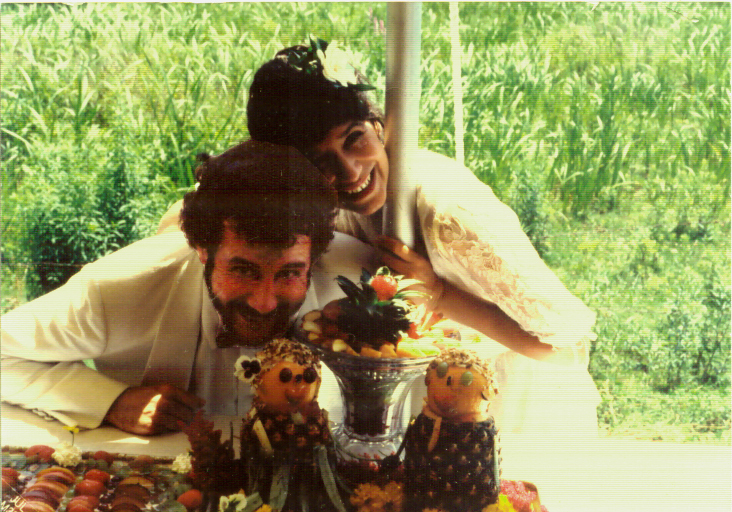 That was 26 years ago; now I take my job seriously as Chris’ sous chef, his vegetable gardener (but as a landscape designer, I have to sneak in edible flowers), and wife providing him whatever our Zone 5a can grow including zucchinis. While most people bemoan the abundant yield of zucchinis, Chris sees it as opportunity to dice them in 1/2-inch pieces, which he cooks in olive oil. He stresses the greater the surface exposed, the more the flavor. Sometimes he’ll combine it with my shallots, other times garlic scapes. I’ll try the same method, and it’s never the same; I think he sneaks a little truffle oil or some other surprise soupçon on top. Chris makes terrific fennel salads with shaved parmesan cheese and a fennel soup with just onion, leeks, hint of garlic all simmered in a chicken stock. It tastes like it’s filled with cream, but there’s not a drop of dairy. So one summer I grew fennel, but the bulbs were so small that it wasn’t worth dedicating the private space these vegetable snobs demand – they will only grow with others in the mint family. Someday I want to raise chickens for him to make into a stock, but so far I can’t get pass the Disney doe, Bambi, effect as he calls it…chickens are just too cute to kill. Of course summer means tomatoes. At our home that means green tomatoes coated with corn meal and fried gently and eaten immediately, burning your fingers. The red tomatoes, he seeds and cores so all that remains is the flesh, an ideal ingredient for his new passion, terrines. His porcini, artichoke and tomato terrine is another reason to love hot weather. Fall affords him so many cooking opportunities. Chris insists on waiting till we have a frost for really good kale. My job is to wash and de-rib the kale leaves, which he transforms into a pile of thin strips. After a quick steaming and sautéing with garlic, he’ll pour just a dash of decade aged balsamic vinegar on top before serving. Chilly temperatures also sweeten Brussels sprouts, which he chops into small pieces and roasts with olive oil and salt. People constantly tell me how lucky I am to married to someone who loves to cook and is so good at. True, but I made conscious choice decades ago thanks to his lamb curry and burnt butter.